While developing the new mobile design, we tested extensively on slow 2G mobile networks. That highlighted several performance improvements we could make to the site. For example, we now use data URIs for small images so your browser makes fewer network requests. We also trimmed down the size of some larger files and improved how we use web caches. Our data shows the new design loads up to 50% faster than before. If you're a typical mobile user with 3G or 4G speeds, the site should be pretty snappy. We perform similar resizing tricks to optimize the site's appearance depending on how much screen real estate you have. If you don't see a particular feature on your phone, try rotating to landscape mode and more features will appear. You can also pull down on the top of the page to show the Search and Log In features. One of the best parts about this design is that all PriceCharting features are available on all devices. If you're at a flea market, you can use the Add Typical Shipping Prices feature to compare prices for online and offline options. 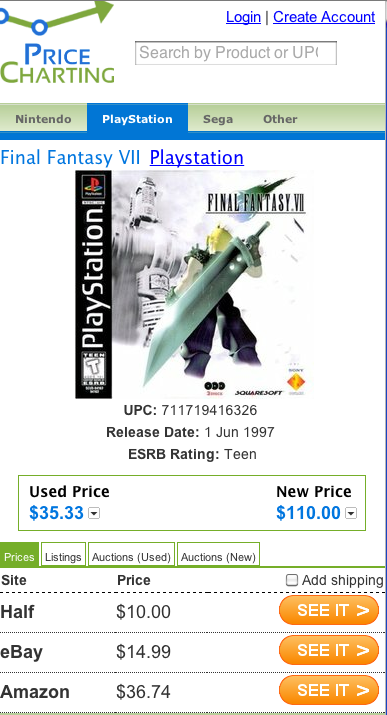 If you're in the basement organizing your collection, you can use the Pricing Cart to see what it's worth. The new site is configured with an icon specifically for your iPhone or Android device's home screen. On your iPhone, tap the icon, choose Add to Home Screen, give it a name and click Add. On your Android device, bookmark the site, then long-press on your home screen. Choose Shortcuts > Bookmark and choose the bookmark you just made. Now you're only one click away from the site. If you don't want to add a bookmark or a home screen icon, you can also type our short URL: vgpc.com which redirects to the games site. If you notice anything wrong with the new site, please let us know about it in the comments below. Be sure to mention which device you were using when you spotted the problem so we can fix the bug. Over all things look really good. I would recommend putting some left/right padding on a lot of elements though as it appears they are right on the edge of the screen. Also, the logo seems to be cutting off on the left side. Thanks. Which mobile device are you using? That'll help us fix the problems you're seeing.